When the new emphasis in the Common Core on information texts it’s an interesting challenge to blend non-fiction with literature and give students a chance to compare the two. This week fifth graders did just that. First they looked at some original source material related to the Orphan Trains of the late 1800’s and did the thinking routine, See. Think, Wonder. 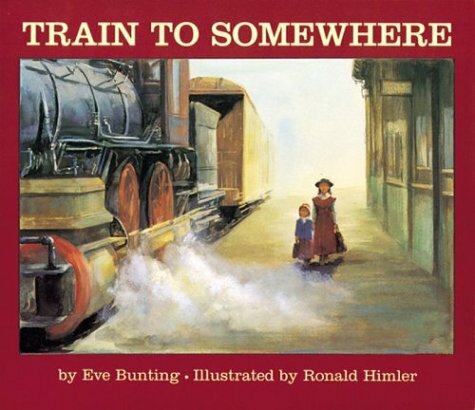 This perfectly set the stage for Eve Bunting’s touching story Train to Somewhere. (Alert: This is one of those read alouds that will give you a lump in your throat). By seeing actual photographs of the trains and the posters that were sent out to the mid-West prior to the trains’ arrivals, students were able to really connect with the story. I also put on display the excellent non-fiction book, Orphan Train Rider by Andrea Warren and students spent time on their own perusing it. Seeing the connection between fiction and non-fiction that deals with the same subject matter helped students delineate the differences and see how each form has its strengths. Kindergarten–Kindergarteners loved Can’t Sleep Without Sheep by Susanna Hill. The idea of “counting sheep” was new to them and it gave us a chance to discuss real and imagined actions in a story. At the end, they all cuddled up on the floor and practiced counting sheep themselves and promised they would try it at night when they went to bed! First, Second, and Third Grade–We are narrowing down own choices for California Young Reader Medal Winner 2012-13. This week two classes voted using the official ballot and placing their votes in the ballot box. Sixth Grade- We had another practice session using our Advanced Google Skills. Learning to search efficiently will help with next week’s classroom assignment which is a WebQuest about Ancient Greece.